Humboldt State University American Indian faculty, staff, and students will host the 25th Annual Indigenous Peoples Week October 8-12. HSU events and activities are focused on Indigenous issues, ideologies, and methods. 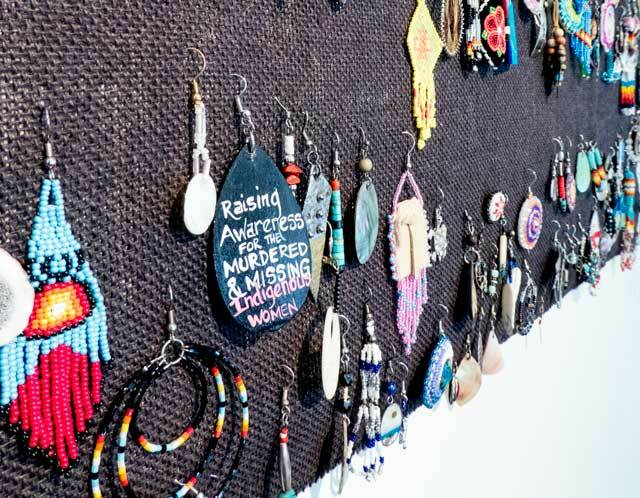 “Sing Our Rivers Red” is a traveling earring exhibit at the Goudi’ni Gallery aimed at raising awareness of missing and murdered indigenous women — an issue highlighted during Indigenous Peoples Week. Indigenous Peoples Week challenges the idea that Christopher Columbus “discovered” America and a reminder of the atrocities and injustices against Natives of the Americas. HSU’s effort to find an alternative celebration to Columbus Day across the California State University system has been part of a nationwide movement. In 1992, Berkeley, California, became the first U.S. city to celebrate Indigenous People’s Day instead of Columbus Day. As of 2017, nearly 60 cities across the country have embraced Indigenous Peoples Day, according to Time. This documentary analyzes the Washington, D.C., football team and their use of the derogatory term R*dskins. Using interviews from both those in favor of changing the name and those against, “More Than A Word” presents a deeper analysis of the many issues surrounding the team’s name. It also examines the history of Native American cultural appropriation. Discussion led by ITEPP staff. Film screening and discussion with Rain Marshall, J.D.